The Internet in Qatar is sufficiently developed. Back in 2007, the republic was recognized as the second country in the world for the Internet penetration, with more than half of the local residents using it. And this is 1 million 186 463 people of 2 million 391 thousand 902 citizens, representing almost 70% of the population. At the same time, because of climatic and landscape conditions social and computer activities are concentrated around major cities. People say the best coverage in Doha, the capital of Qatar. From this standpoint, it is better off installing VoIP gateway gsm here. It is important that a terminator connect the equipment in places where there is wired the Internet available. Otherwise you'll have to install it for three weeks, with the permission of the Qatari Residence, and produce a copy of the passport and the sign the contract. The telecommunication system in Qatar is constantly being upgraded, in connection with the upcoming football World Cup 2020. The major ISPs in Qatar are Qatar Telecom (Qtel) and Vodafone Qatar. The former is the most popular provider in the provision of Internet access via ADSL. The latter provides users with a broadband access and mobile Internet. QTEL offers a number of packages of 10, 25, 100, 300 MB, and 1 GB. There are still more tariff plans: 1 MB, 2 MB, 5 MB or 8 MB. For VoIP solution provider Qatar, it will be enough to order a 10 MB package, and ADSL 1 MB. The main condition to connect is the monthly payment in the amount of $68.67. The provider offers ADSL, including landline and TV service under a 3-month contract. 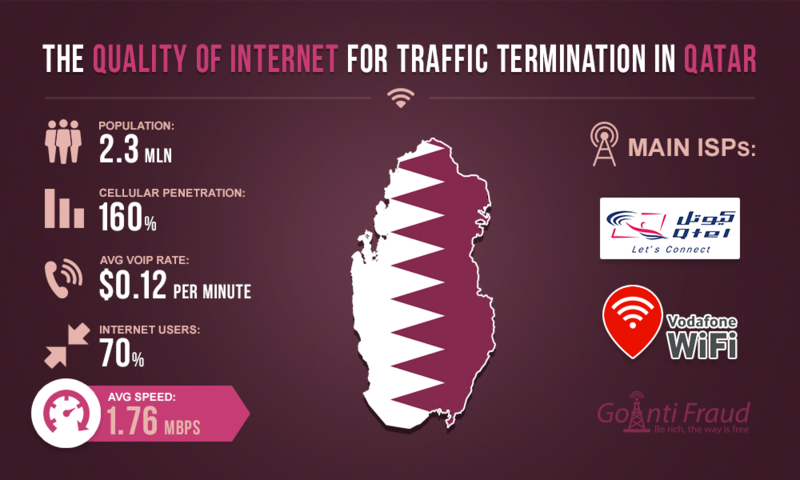 By the way, the cost of termination in the direction of Qatar is $0.1145 per minute. At the same time, net profit is from $0.109 per minute. By multiplying this amount by a certain number of hours and days, the profit equals to $1,373.40 per month from a single channel. When installing multichannel equipment, for example, GoIP 32 port, that figure is multiplied by the number of channels.